Hello! I have a card for this week's MFT Wednesday Sketch Challenge 283. Hop on over to the MFT Challenge Blog for details on how you can play along to win a $20 MFT voucher. 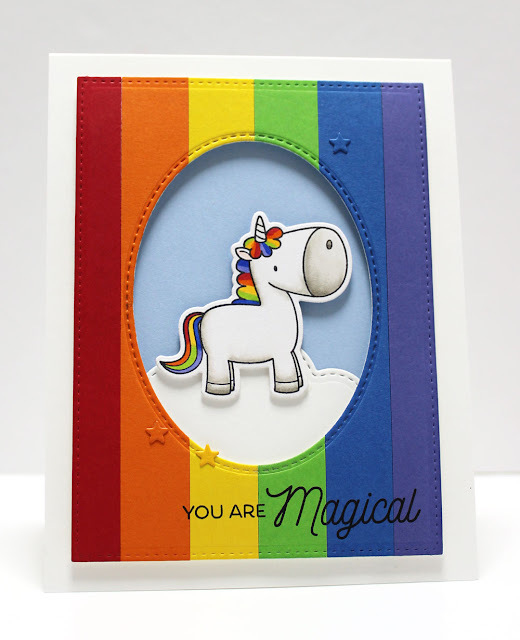 My card uses the super sweet Magical Unicorns stamp set and Die-namics. I framed the cute character with a rainbow panel I created with strips of colored card stock. The front is accented with teeny stars cut from card stock. Smartest thing ever! I love those little stars in the matching colors! What a fantastic idea! AWE this is very cute!!!! What color did you use for the Dark Blue? You have indeed, made a magical card.